My interest in exploring the northern part of the Philippines started from looking at a piece of art at the Asian Art Museum in San Francisco, California. Among the display of ceramics and pottery engraved with gold and other decorative stuff, a wooden carving of a male figure squatting on a platform with the lower arms on top of each other, resting upon his knees, caught my eye. According to the docent, the wooden sculpture was called "Bului" which literally means "granary guardian" in the "Ifugao" tribe dialect. The carved wooden sculpture was set on a platform on top of another platform, a mortar. Our docent explained the significance of the wooden mortar (which was used with the pestle, to separate the husk from the rice, sort of rice mill) and linked the story to the Rice Terraces in the Cordillera Mountains of the Philippines built 2000 years ago by the “Ifugao” tribe. So two years and three hundred kilometers north of Manila later, we explore the mountain province. We hike over dirt roads and reach the top of the mountain almost an hour later to see the mystical view. The Ifugao Rice Terraces follow the natural contours of the mountains and rise thousands of feet to form a very dramatic landscape. It's a breathtaking view. The view proved what the docent at the SF museum told me, in that the rice terraces were built without coercion, meaning no government intervention. 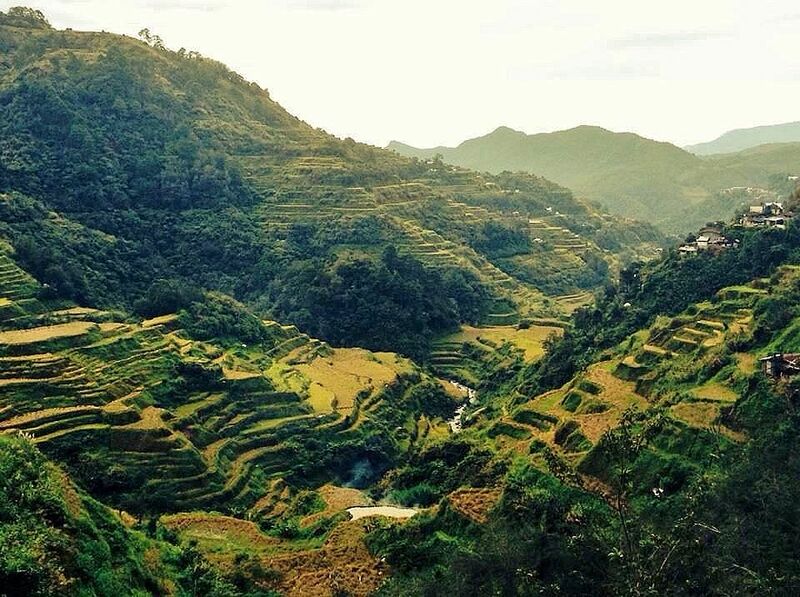 The Ifugao Rice Terraces of the Cordilleras appear to be the only monuments in the Philippines that show no evidence of influence by colonial cultures. 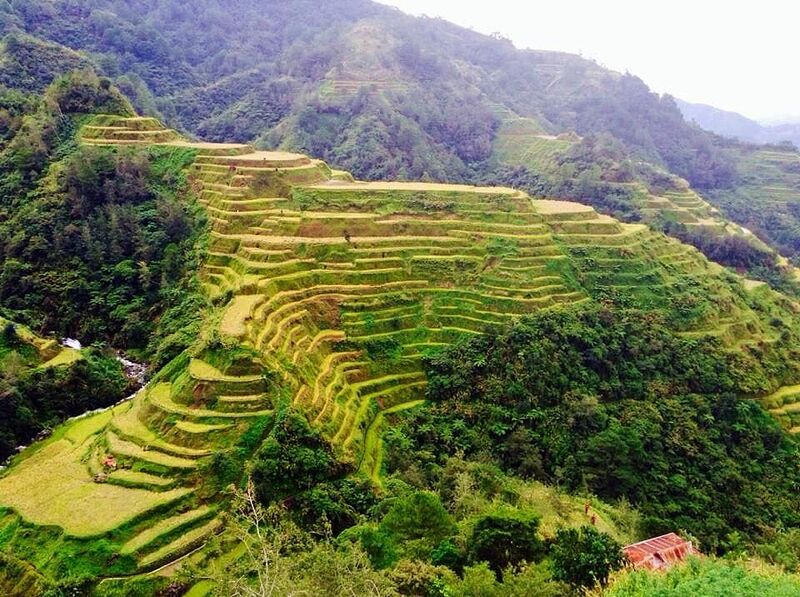 The "Ifugao" tribe developed a perfect working irrigation system by harvesting water from the mountaintop to develop an elaborate rice farming system for their needs. Not only fascinated by the physical beauty of the landscape, but my curiosity about the tribe who built this amazing structure never relented since I learned a little bit of their culture through their art: A unique culture that revolves around rice and expresses through festivals, rituals, dances, music, and food. 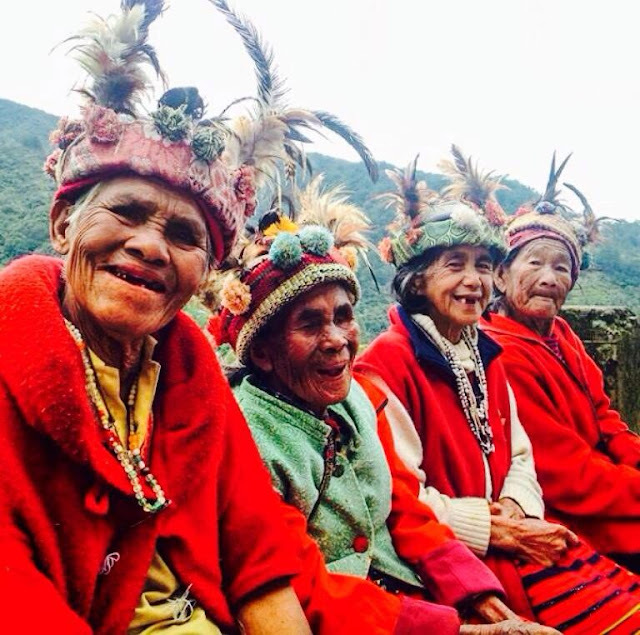 We have a sampling of the culture through the elders who give us their toothless smiles. If not toothless, their teeth have orange and reddish stains from chewing 'betel nut' and tobacco. The Ifugaos are renowned for their colorful textile and clothing woven on looms. It's very cold in the mountains, so the folks wear sweaters over their traditional attire: the colorful "tapis" for women and "G" string for men. However, the present day Ifugaos are caught in the classic dilemma of finding their place in the fastness of the mountains. Away from their village, the Ifugao wood carvers whose ancient tradition has been handed down from father to son in generations now work in the nearby wood carving factory. The Ifugao women, who wear their colorfully loom-woven garb, sit at the primitive looms in the Protestant-owned school. 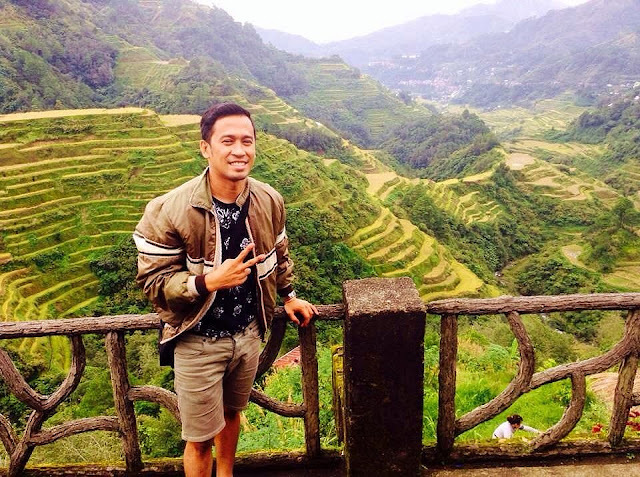 Their creation is prime tourist attractions in Baguio City, a popular tourist destination within the country. A few kilometers away, there are still those who go on with their daily lives. I see a young man who just came down from his hilly farm. He deposited the sackful of his harvest in the corner of his hut, and with his child in his lap, his young wife in the yard scouring for dried twigs to cook the evening meal, his pet chicken beside him, and chewing tobacco, he contemplates life, or the time and space, or perhaps the memory which confined the existence of his people. 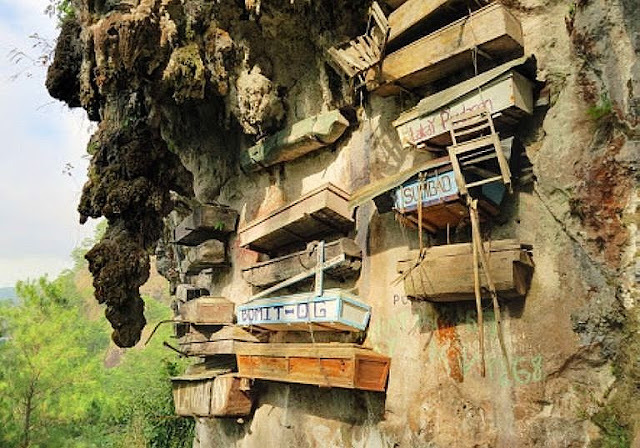 One of the many features that are distinct to the Ifugaos are the hanging coffins and burying the dead in caves. I realized that their religion was far more complex than what the western missionaries offered them in its stead. UNESCO declared the Ifugao Rice Terraces of the Cordilleras as a World Heritage site in 1995 due to the blending of the physical landscape, cultural, economic, religious and political environment as a living cultural landscape. Many foreigners are only familiar with the beaches of Palawan and Boracay in the Philippines. And it’s sad that the Philippines is not included as a tourist destination by the popular purveyors of mass tourism like Gate1 or by the cruise lines, which usually include Cambodia, Thailand and Vietnam. And I think Philippines politics are partly to blame for the Philippines lagging behind the Southeast Asian countries when it comes to tourism. It’s unfortunate because the Philippines is full of living cultural landscape of unparalleled beauty.